1971 was a fateful year for Coupla Prog as singer and guitarist Rolf Peters died of a sleeping-pill and alcohol overdose. As the band's main musical influence and songwriter he left a huge gap that the other musicians were at first unable to fill asking themselves whether Coupla Prog should continue or split. It took the remaining members, Wolfgang Schindhelm (organ, piano, and vocals), Reiner Niketta (bass, organ and piano) und Hubert Donauer (drums), a few months to get to grips with the shock of their loss. They decided to have a go anyway and recruited a friend of Schindhelm's, Walter Kummich, as the new guitarist. Vocals were shared between Schindhelm and Niketta who had started writing new material together. At the end of the year the band was ready to play a live set of new and old material. 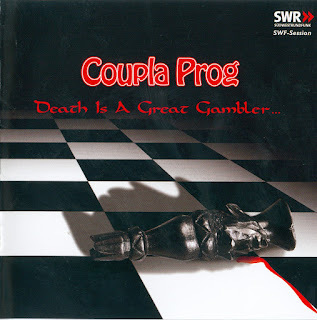 It was also time to go into the studio and it was a great help to Coupla Prog that they were, together with Fashion Pink (Long Hair LHC 3), one of SWF Producer Walther Krause's favourite bands, resulting in him booking the band into SWF's studio. In the meantime drummer and founding member Donauer left the band and for the SWF-Studio U1 session on 18. 02. 1972 Reinhold Hirt, who has since made a career as a professional musician (amongst others Hubert K.), was drafted in. With this line-up Coupla Prog recorded four songs which form the basis of this CD. One of the most outstanding tracks on the CD is the 18 minute long title track "Death Is A Great Gambler ...", a true emotive, dynamic and hypnotic masterpiece of psychedelic underground rock dedicated to Rolf Peters. The rest of the tracks on the CD are made up of a previously unreleased SWF session from 16. 02. 1970, with a highly individual interpretation of Donovan's "Season Of The Witch". Also included on this CD is "Your Time Has Come", an early version of "Pamphlet To Mr. M. Thompson" which appears on Coupla Prog's rock opera Edmundo Lopez. This CD rounds off the SWF produced Coupla Prog trilogy. 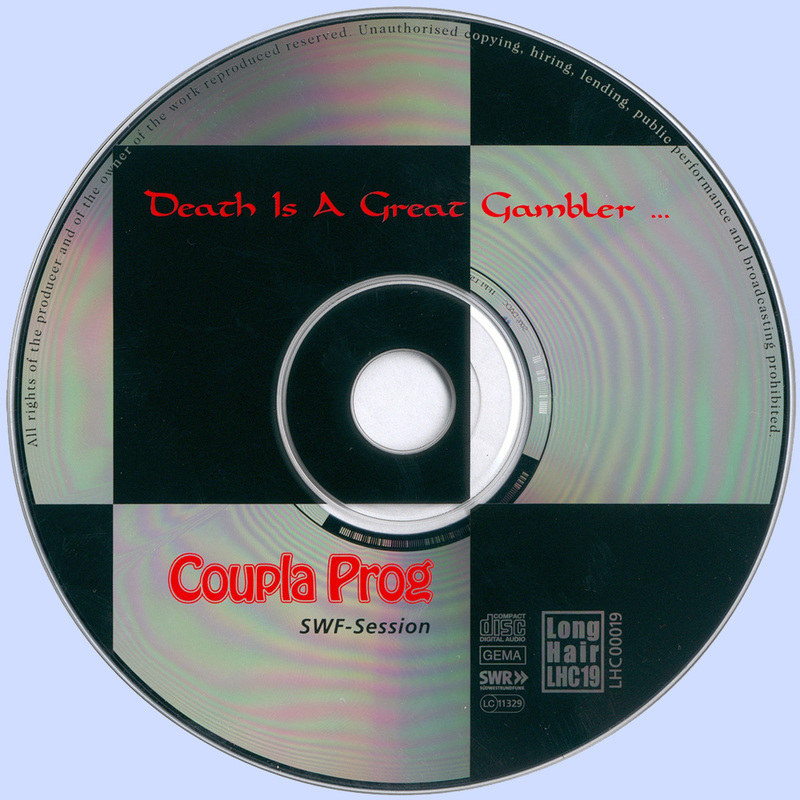 Further information about the band can be obtained by purchasing the following CDs: Coupla Prog "Sprite" SWF-Session Vol. 2 (Long Hair LHC 2) and "Edmundo Lopez" SWF-Session Vol. 4 (Long Hair LHC 4). "Sprite" includes three of five tracks from the first SWF session (26.02.1970) and all four tracks from the third recording session (16. 04. 1971). The usage of the term "session" does not stand for spontaneous improvisation (although some of the tracks last over twelve minutes!) but describes the circumstances and conditions that Coupla Prog had to put up with at these radio sessions. All of the tracks were recorded live in the studio with no possibility for overdubbing and editing. The best tracks were then chosen for broadcast. "Sprite" was first released in September 2000 to the acclaim of underground and progressive rock fans. Finding these wonderful recordings from a mainly unknown band could be compared with striking gold. The quality of the music has been widely celebrated in the media: Oldie Markt (04/02): Listening to the quality of this record it is hard to understand why the record companies didn't give this band a chance. Good Times (04/01): Referring to the song "Ode To The Vanilla Fudge" Coupla Prog were a cross between the American band of the same name via a musical slaughtering of classic Stax soul such as Arthur Conley's "I Wanna Be Free" best known in Europe in a grooving version by the VIPs to their own long wild and dreamy compositions such as "Auf dass er sich im Grabe umdrehe" (engl. that he would turn in his grave) "Edmundo Lopez", Coupla Prog/s masterpiece, recorded on the 16.07.1970, is a German rock opera about a young South American who escaped military service by fleeing to the mountain calling on others to desert. Good Times (04/01) compared the band to The Doors and The Nice and Wolfgang Schindhelm's vocals to Jim Morrison. The 60 minutes were recorded "live" in the studio in two takes. The recordings were then offered to the label Liberty (Amon Duul 2, Can etc.) and inexplicably refused. It is left up to every listener themselves to judge Coupla Progs significance within the German underground and progressive rock scene. For LONG HAIR the band is an enrichment within this genre. Many thanks to SWF for producing, archiving and licensing these recordings.